When it comes to auto sound a system, one question seems to be repeated often-is bigger better? The honest answer for that is not by a long shot. There are the excellent quality sound systems that will not require the backseat and your first-born to enjoy wonderful quality of sound and music as you drive along on you’re daily commute. One thing that is important to remember is that dynamite does in fact come in small packages. 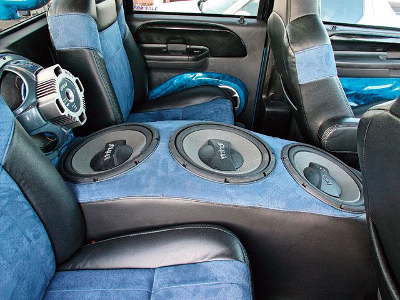 The same can be true of a good quality sound system for your car, truck, or SUV. You can elect to have the full range sound package. This package, if not custom installed by the dealer can take up many of real estate within your car, truck, or SUV. If you own a compact car, these types of speakers and this particular type of sound system is definitely not recommended. The first reason it is unattractive is that it will most likely require either most of your trunk or take out your back seat. I for one like being able to cart around friends, relatives, and/or children-my back seat isn’t up for grabs. I also prefer the continuity of a factory-installed system that takes up none of the premium living space within the interior of my SUV. I am biased towards the wonderful sound quality of the Bose sound system and speakers. The quality of sound with this particular system is excellent and any true music lover will tell you that good quality of sound is better by far than a louder sound. This is not to say that the Bose sound system will be the perfect choice for everyone to use as his or her auto sound system only that it is my first choice as a music lover. I prefer a softer sound that has good quality to a louder sound of the substandard or even average quality on any day. The problem with most ‘big’ sound systems and speakers is that they often sound hollow or tinny rather than full and robust. A good auto sound system will provide the best possible sound within the confines of the least possible space. You will probably find that you don’t need to sacrifice your backseat in order to hold the speakers and while the Bose sound system for automobiles does cost more than some sound systems, it won’t require a second mortgage on your home in order to afford. There are actually times in life when you get what you pay for. The important thing to remember is that you do not have to have the most expensive, the best known, or even the biggest sound system in order to have a wonderful quality sound system in your automobile. You will not even have to have a Bose sound system in order to have a sound system that is not only excellent quality but also excellent sound. You do not need to pay an arm and a leg or any other appendages in order to have a good sound on your daily commute to work. Music is all around us, at work, at home, on television shows. Music sets moods, sets tones, and kills moods on occasion. It only makes sense that you have good quality equipment upon which to play the music that so greatly enhances and enriches your life. If you are in the market for an auto sound system it only makes sense to listen to several before deciding on the one that will work best with your musical tastes and your desire for your vehicle sound system. Don’t be misled by commission minded sales associated that think you need the latest, greatest, and most expensive toy on the market. Find a system that sounds good to you and go with that system. You do not have to go for a better sound if you find a sound you like that should be enough.